Grande Cache, Alberta (population: over 3,800 ) was established to take advantage of economic development opportunities which emerged as a result of lumber and coal mining businesses opening in the area. The coal and lumber industries are represented on the municipal flag by a coal miner's lantern, lodgepole pine, pine branches, pick axe and wood axe. The abundance of hunting and fishing opportunities found in the region are illustrated on the flag and town crest by two crossed hunting rifles and a fish. 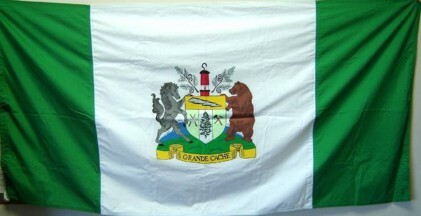 The Willmore Wilderness Park, the largest in Alberta, is reflected in the illustration of a brown bear supporting the town's crest as well as the use of green on the flag. The mountain range on the flag emphasizes the fact that the town is situated on a high plateau at an elevation of 4,200 feet above sea level which gives a dramatic panoramic view of 21 mountain peaks in the Canadian Rocky Mountain Range and 2 river valleys. The illustration of a lightening bolt on the town's crest may be a reference to the town's rapid growth which started in the early 1970's soon after provincial legislation allowed for construction of the new community. 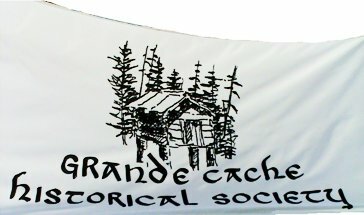 The flag of the Grande Cache Historical Society features an image of a small wooden structure which was used to store furs. This building was elevated on four large poles to discourage other trappers and wildlife from taking the furs stored inside. A replica of such a structure is displayed at the Tourism and Interpretive Centre in the Town of Grande Cache (http://grandecache.ca/tourism/the-tourism-interpretive-centre/general-information).